Dancers are the supreme athletes, therefore Bloch introduces this new patented stretch pointe shoe to it's Dance Sports Fusion line, this version is aptly called, Elegance. The first thing you will notice is the incredible lightness. Weight-wise these are our lightest pointe shoes to date, yet you will find them incredibly supportive. The box shape is so elegant and designed to fit and support the foot for maximum comfort. • Bloch’s revolutionary new “Relevease” insole allows you to easily roll through relevé onto pointe while strategically placed cushioning provides ultimate shock absorption and gives you a sports shoe feel. • The vamp features a beautifully shaped, graduated toe box made with long lasting, all natural materials and Bloch A-Paste formula for superior performance and support. 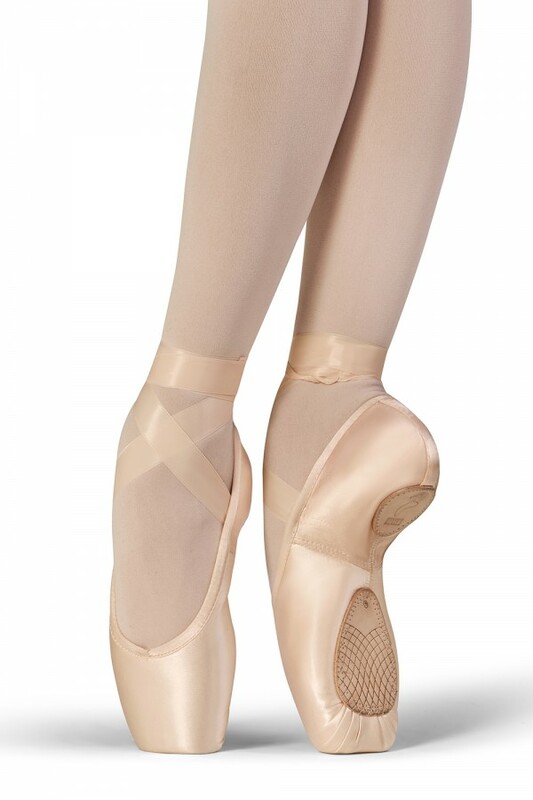 • This patented stretch pointe shoe hugs the heel at all times, resulting in a clean line. • The Elegance stretch pointe shoe has a very flat profile under supporting foot, so there’s no rolling when standing flat. • The durable, full grain leather split sole outsole, with lightweight construction and laser-scored pattern, provides ultimate traction and control. • Elegance has an extremely flattened platform that gives you excellent stability and balance in all directions. It has an internally cushioned toe box for incredible comfort and noise reduction technology under the pleats to keep you silent on stage.